ate our dinners. I went over to Aunt Ellens and had the [horse?] put up. I spent part of the afternoon there. When I came home I took the rest of the eggs out of the incubator as it was done hatching and set a couple more hens. I got some eggs down at Aunt Ellens. The boys did not get the fence quite done. This is Rob Whetstones birthday. he is eleven today. Wednesday May 30th 1894 I was busy all forenoon. I set the incubator again and did some extra work about the house. I went to town in the afternoon alone and spent most of the time over the river. Fanny feels very much better than she did Sunday evening. I got home in time to see to my evening work. It was decoration day. 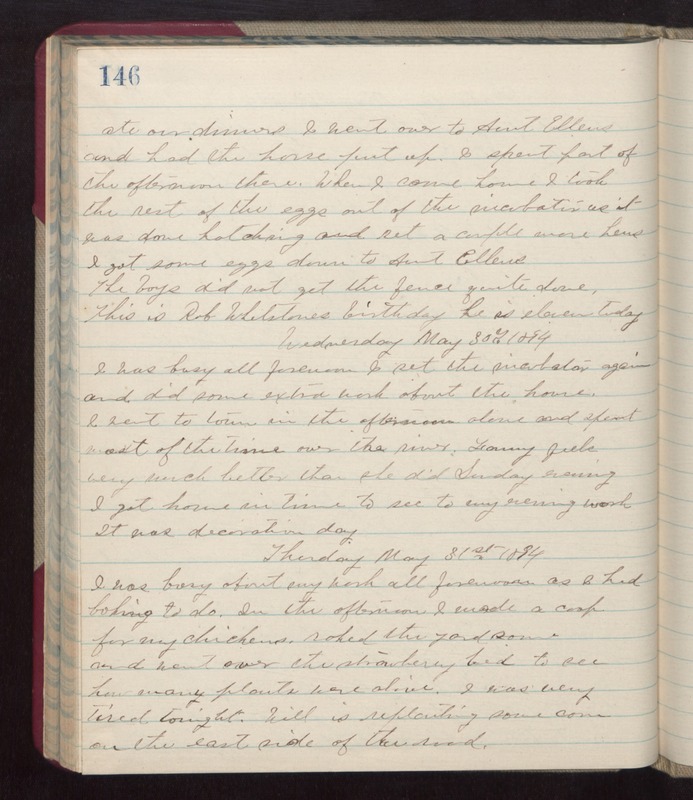 Thursday May 31st 1894 I was busy about my work all forenoon as I had baking to do. In the afternoon I made a coop for my chickens, raked the yard some, and went over the strawberry bed to see how many plants were alive. I was very tired tonight. Will is replanting some corn on the east side of the road.